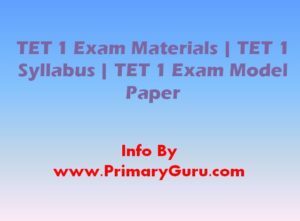 TET 1 Exam Materials | TET 1 Syllabus | TET 1 Exam Model Paper: Gujarat Education Department conduct Teacher Eligibility Test TET 1 Exam for recruit teachers in primary School. Here we provide TET 1 Exam Materials | TET 1 Syllabus | TET 1 Exam Model Paper for TET 1 Exam. Candidates may use these all materials for better preparation. Gujarat State Examination Board published notification for TET 1 Exam. Gujarat Education Department conduct TET 1 Exam every year. This year also Department will conduct TET 1 Exam. Candidates who looking for job in teaching field for them TET 1 Exam provide a good opportunity. Here we provide a TET 1 Exam Materials | TET 1 Syllabus | TET 1 Exam Model Paper for candidates who male preparation for TET 1 Exam. Candidates are advise that bookmark this page by CTRL D and b touch regular on this page for get more latest update about TET 1 Exam Materials | TET 1 Syllabus | TET 1 Exam Model Paper.